If you follow me on instagram or facebook you might have seen the "sesame seed spotlight" series where I spoke about sesame seeds and highlighted different recipes that had them. I use sesame seeds in a lot of recipes and I love them! 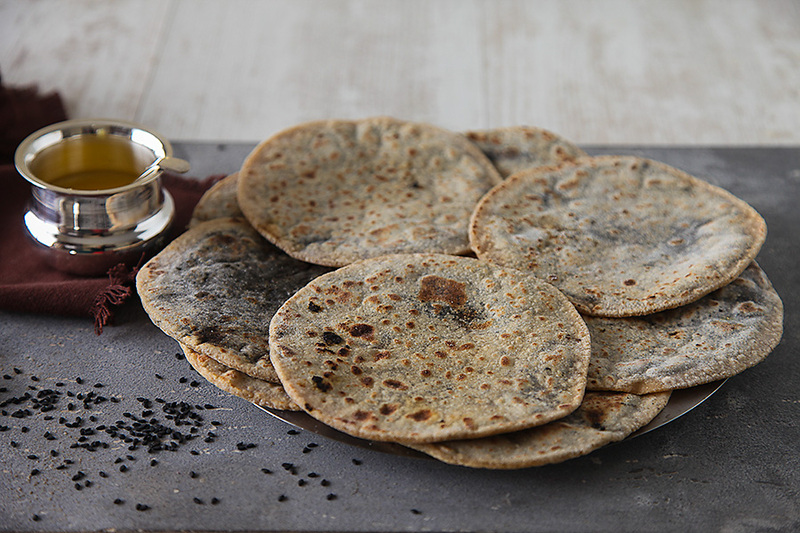 I had been using black sesame seeds to make sauteed vegetables and vegetable parathas and was always impressed with the beautiful speck of colour that they added to a dish. When I found black sesame seeds on a restaurant menu recently on a visit to Pune during my cousin’s engagement after party, I had to order the black sesame ice cream. Although someone remarked that it looked like a mound of cement when it arrived, I was fascinated with its colour and texture. The ice cream was sort of a cultivated taste and it grew on my palate after a few spoons. This time during the Indian festival Sankranti, I had Sachi who used to be my help when my son was born, visiting me for a few days. 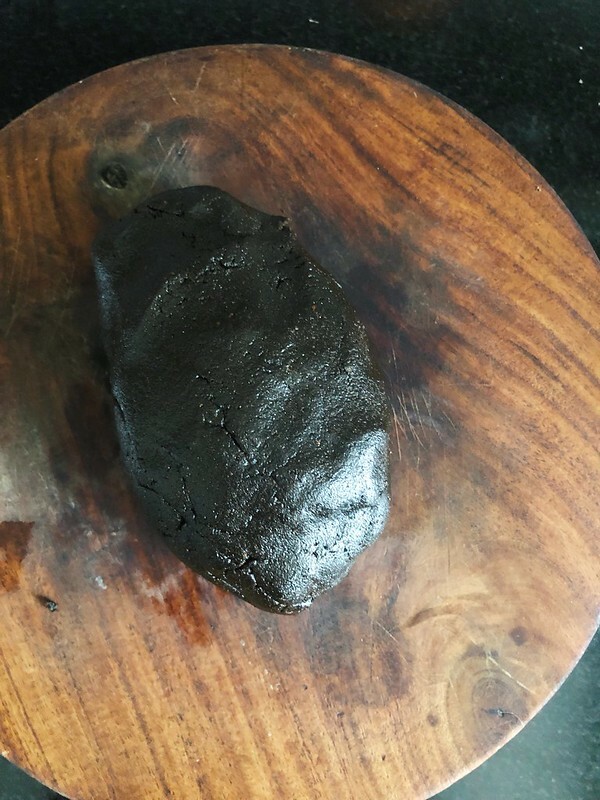 She suggested that instead of white sesame seeds lets use black sesame seeds like they did in her village in North Karnataka, to make holgi (holige), a pancake made with sesame jaggery mixture with a covering of whole wheat dough. 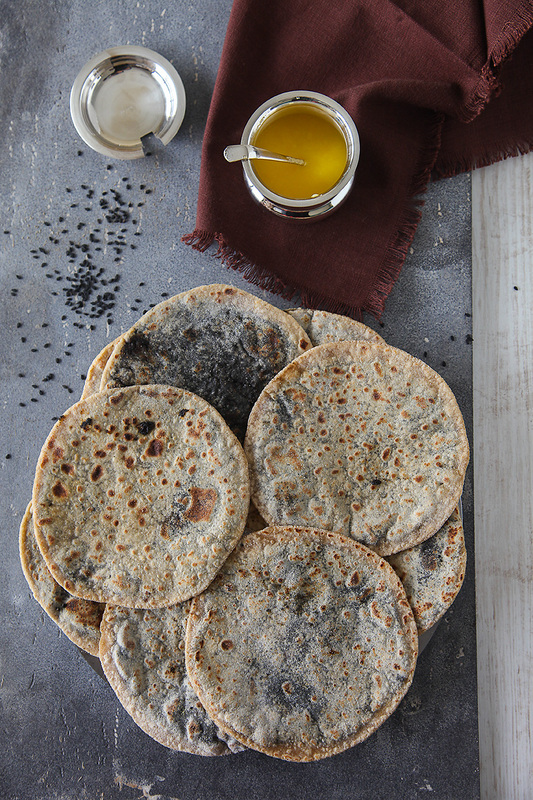 These black sesame pancakes are a rustic village dish from North Karnataka. They have a wonderful flavour and when eaten with ghee, they taste absolutely delectable! Sesame seed and its oil are highly revered in Ayurveda. In the winter season, the festivals also incorporate sesame seeds as they bring warmth and nourishment in the cold weather. White sesame seeds are nothing but hulled black sesame seeds. Black sesame seeds have more calcium than their white counterparts making them nutritionally more powerful. Black sesame seeds are full of flavour and nutrition. They have antiageing properties, are good for the bones and when eaten in moderation according to the season and the body type, can also play a role in preventing diseases and stabilising blood pressure. Black sesame seeds are better digested when soaked in water or when ground into a powder. The oil in the sesame seeds lubricate the intestines and coupled with the fiber content helps in preventing constipation. 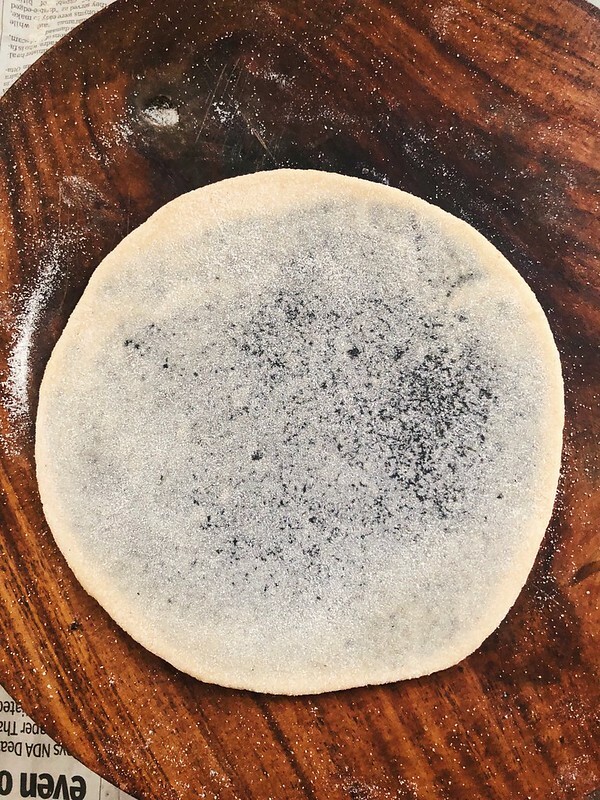 These black sesame seed pancakes taste wonderful in the winter season. When eaten with a dollop of golden ghee, it tastes great and can be very satiating. Enjoy these sweet treats loaded with nutrition and health as we are slowly progressing from the winter season (shishir ritu) to the spring season (vasant ritu) and while the cool weather of winter is still in the air. Dry roast the sesame seeds for 8 to 10 minutes on a medium flame. Alternatively put in the sesame seeds on a tray and bake in the oven at 180 C for about 12 to 15 minutes. Allow the sesame seeds to cook down. Powder the sesame seeds by pulsing. Add the jaggery into the mixer little by little and make a paste. Form into laddus or small balls. In a bowl or large plate assemble all the ingredients for the dough, make the dough and allow to rest for an hour. Make small balls of dough as many as the sesame seed mixture laddus. Flatten each dough ball with your palm and stuff with the sesame mixture. 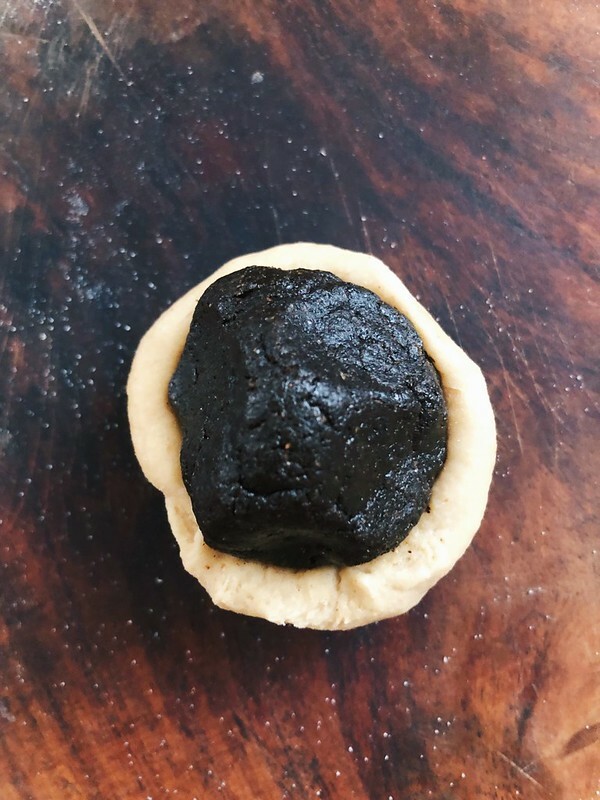 Close the covering while encasing the sesame mixture inside the dough, gather all the corners together and pinch to seal. Sprinkle the dough ball with some flour and roll into a 6” circle making sure that the dough does not stick to the surface. 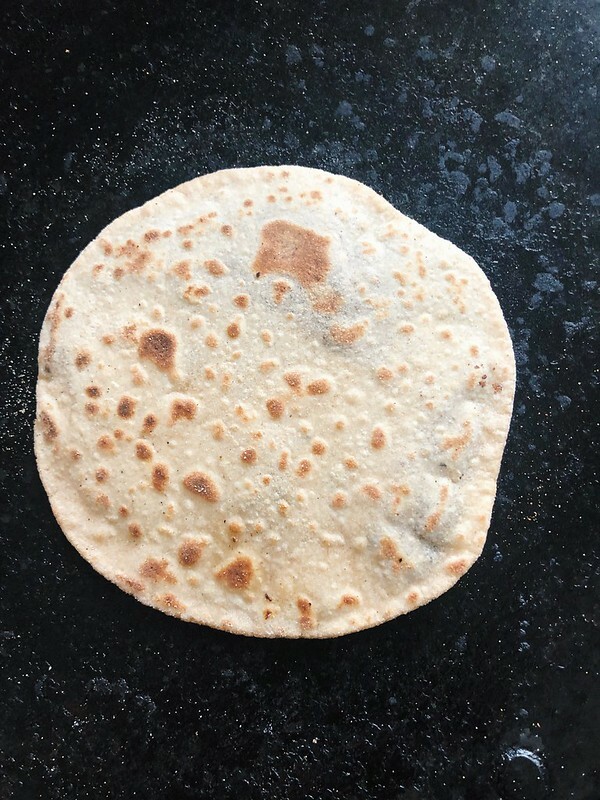 On a griddle or tava, place the rolled disc and cook until brown spots appear all over. Is jaggery good in tea? As per Ayurveda milk & jaggery combination is good for health? I must say that's a great combination of all the flavors and it looks beautiful and yummy. Yes, you can use jaggery and milk together. They have been used in many traditional recipes too. With tea, raw sugar would taste good.